Edin Dzeko continued his fine run of form in the Champions League by scoring twice and setting up another to lead Roma to a 3-0 victory over CSKA Moscow in Group G.
Following a hat-trick in Roma's last Champions League outing against Viktoria Plzen, Dzeko was at his best again on Tuesday, taking the game away from CSKA – who beat defending champions Real Madrid in their previous outing – in the space of 13 first-half minutes. Having rounded off a superb passing move for Roma's opener, the Bosnia-Herzegovina striker doubled the hosts' tally with a typically composed finish in the 43rd minute. Dzeko was not done there, though, claiming an assist five minutes into the second half when Cengiz Under hammered home to wrap up the points and move Roma up to second. Eusebio Di Francesco's side were second best early on but went ahead on the half-hour mark, Dzeko nudging home from Lorenzo Pellegrini's cutback at the culmination of an exquisite team move. An under-hit pass towards Under stopped the former Manchester City striker from turning provider, while the impressive Nikola Vlasic tested Robin Olsen at the other end. But Roma got their second when Stephan El Shaarawy teed up Dzeko, who made no mistake with a first-time effort into the bottom-left corner. Roma showed no signs of slowing down after the restart and made it three when Under thumped in a half-volley from Dzeko's knock-down. Dzeko sent a header from inside the six-yard box wide to miss out on his hat-trick and a tremendous stop from Ilya Pomazun stopped Alessandro Florenzi from making the victory even more comprehensive in the 92nd minute. Madrid may be in a poor run of form, but Julen Lopetegui's side are still favourites to progress from Group G after a 2-1 win over Plzen. 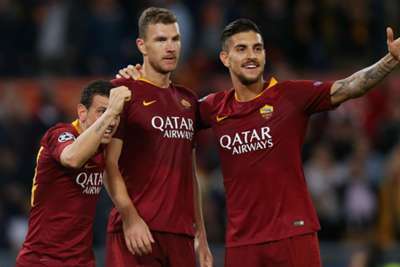 This double-header between Roma and CSKA could have a significant outcome on a potential battle for second place and Dzeko, with his five goals in three Champions League appearances this term, could well be the difference for last season's semi-finalists. Dzeko will rightly take the plaudits, but credit must also go to Pellegrini. The former Sassuolo midfielder endured a difficult maiden season at Roma but showed his quality with a wonderful piece of skill and vision to set up the home side's first goal, combining wonderfully with El Shaarawy before flicking the ball over Pomazun and into Dzeko's path. Vlasic impressed for CSKA once more, but apart from the midfielder being integral to a decent enough start, the visitors offered little threat once Roma scored their first. Coach Viktor Goncharenko will have to be more adventurous if they are to progress to the knockout stage. - Roma have won their last seven home Champions League games in a row by an aggregate score of 20-2, scoring at least three in their last four victories. - CSKA have lost both of their away Champions League matches against Roma, conceding eight goals in those defeats. - Dzeko has scored 10 Champions League goals for Roma during 2018 – two more than any other player in the calendar year. - Since the 2015-16 season, Dzeko has had a hand in 19 goals in the Champions League (15 goals, four assists) – 14 more than any other Roma player in that time. Roma have a tough trip to Napoli on Sunday, while CSKA are up against fellow Russian Premier League title hopefuls Krasnodar in Moscow on the same day.